Polaroid Universal Collapsible Circular Cone (Trumpet) Studio Softbox For The Sony Alpha NEX-C3, 7, 6, 5N, 5R, 5T, 5, 3, 3N, F3, SLT-A33, A35, A37, A55, A57, A58, A65, A77, A99, DSLR A100, A200, A230, A290, A300, A330, A350, A380, A390, A450, A500, A560, by Polaroid at Kmpacting Studio. MPN: PLD-IFTP-3. Hurry! Limited time offer. Offer valid only while supplies last. Create beautifully softened light on the go. The Polaroid trumpet diffuser is lightweight and collapsible, a perfect combination for easy storage. Create beautifully softened light on the go. The Polaroid trumpet diffuser is lightweight and collapsible, a perfect combination for easy storage. 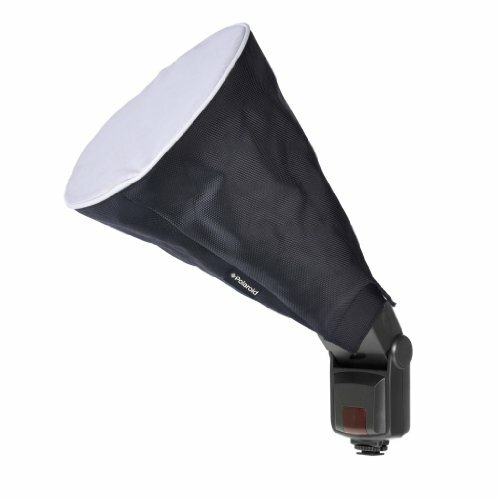 Its cone-shaped design allows light to travel from the flash to an 8" diameter diffusion cloth. The silvered lining and the white diffuser screen combine to give you similar results to that of a studio box. It attaches with the included clinch band.